While we were in Los Angeles recently, Hazel and I were privileged to stay at the home of our friends Zel and Reuben Allen. Zel has been writing great vegan cookbooks for many years, and between them they run the website ‘Vegetarians in Paradise’. The site is a combination of local LA info, general veg news, and of course Zel’s great food – as with most vegetarian organizations and websites in North America these days, it only promotes foods entirely derived from plants (ie suitable for vegans). 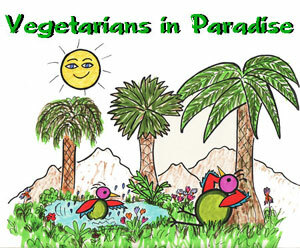 This website is called "Vegetarians in Paradise," and I do hope that Zel and Reuben keep it like that, and do not change it to "Vegans in Paradise" -- but to explain that I have to go back about 170 years. 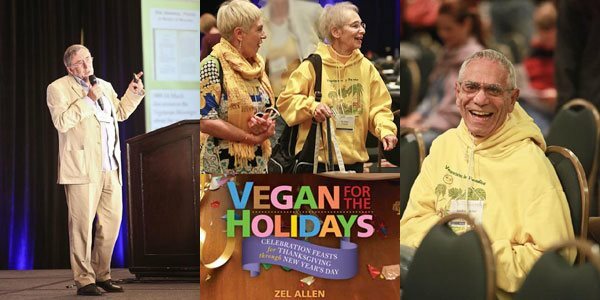 Below: at the Vegsource Healthy Lifestyle Expo - me doing my bit on vegan history - Hazel and Zel looking shocked at someone not wearing yellow - and Reuben keeping warm against the hotel air-con. LA must be the only place on earth where you have to wrap up warm to go indoors.... and Zel's latest great cookbook at the bottom.